Adblock is enabled on this site, please disable it to show more content. The Laboratory for Mathematical Modelling of Environmental and Technological Processes (VTPMML) is a part of University of Latvia, Faculty of Physics and Mathematics. The most important research fields in VTPMML is modelling of coastal processes, dynamics in Gulf of Riga and Baltic proper, sediment transport, wave, vessel and atmospheric interactions, biogeochemical interactions, river network studies, estuaries, lakes and drainage basins, etc. These studies are traditionally made by mathematical modelling. Either finite element or finite difference approaches are used for circulation dynamics at Latvian territorial waters of the Baltic Sea. Operational setup for research purposes is built using HBM/cmod software. 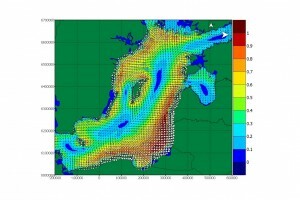 Tracer studies are being used to estimate the exchange between Baltic proper and regional brackish waters. 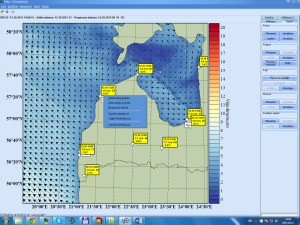 Similar operational setup is launched for the largest lakes in Latvia, particularly for the ice dynamics during the winter. As the wave modelling is important for various coastal processes, ports and long-shore sediment transport different approaches are used for this purpose. It involves also wave climatological studies. For smaller isolated areas like ports, special approaches are applied which involve interactions with different boundaries and obstacles. Wave-vessel interaction is studied by Bousinesq approach. The laboratory has been participating in several significant projects regarding atmosphere and oceanographic processes. VTPMML is a partner in MyOcean/MyO2 projects of the Seventh framework programme. The laboratory has developed an information system FiMar for the delivering, visualization, and analysis of data on marine meteorological and operational oceanography for the Baltic Sea and the North Sea, where data is based on meteorological observation system (by Latvian Environment, Geology and Meteorological Centre (LEGMA)), operational oceanographic (MyOcean2/Danish Meteorological Institute/in-house OO model) and meteorological (DMI, GFS) products. FiMar is used as a decision support tool for navigation, marine search and rescue, fighting oil spills and mine sweeping purposes by Latvian Navy since 2004. The other important research field of VTPMML is climatological studies, which involves studies of historical measurement data by LEGMA and data of climate scenarios. In VTPMML the main tasks of climate change researches are: (1) development of the bias correction methods of the currently available individual future climate projections, (2) analysis of the ensemble of the bias corrected future climate projections, (3) impact studies of the future climate change on derived climate indicators and climate related processes in Latvia.